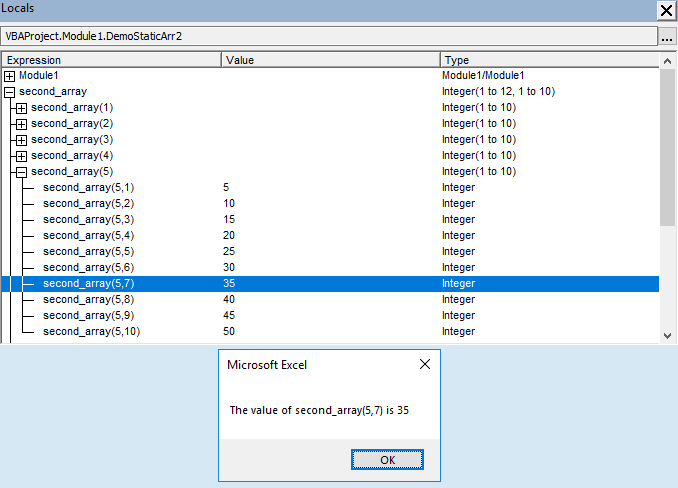 An array is a structure that can store a multidimensional list of data. A variable can store a single element. 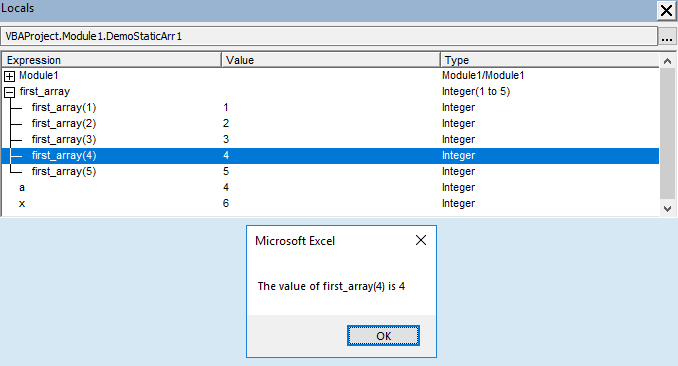 An array is declared in a similar way to a variable, and follows the same naming conventions. 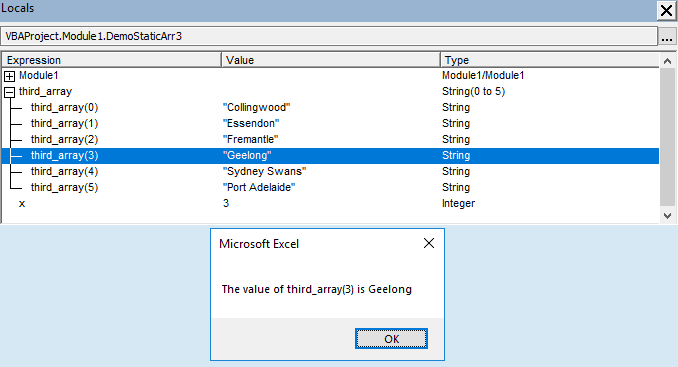 Note: you cannot use the name Array, because Array in a VBA keyword (a function). A static array is given a fixed number of elements at the point of declaration. In other words the analyst needs to know the array dimension before the code is written. Code 1a: DemoStatic1 commas separate the dimensions. The values are the upper index value of the dimension. A static array includes the dimension, and the upper index number elements in the dimension in declaration (Dim) statement. A one dimensional array (row vector), example Price1D in code 1 has no commas in the brackets; a two dimensional array, example Price2D in code 1 has one comma separating the dimension, a three dimensional arrays has two commas, .... A two dimensional array is similar to a worksheet viewed in R1C1 reference style. Cell/element coordinates are denoted by the row, column pair (r, c). 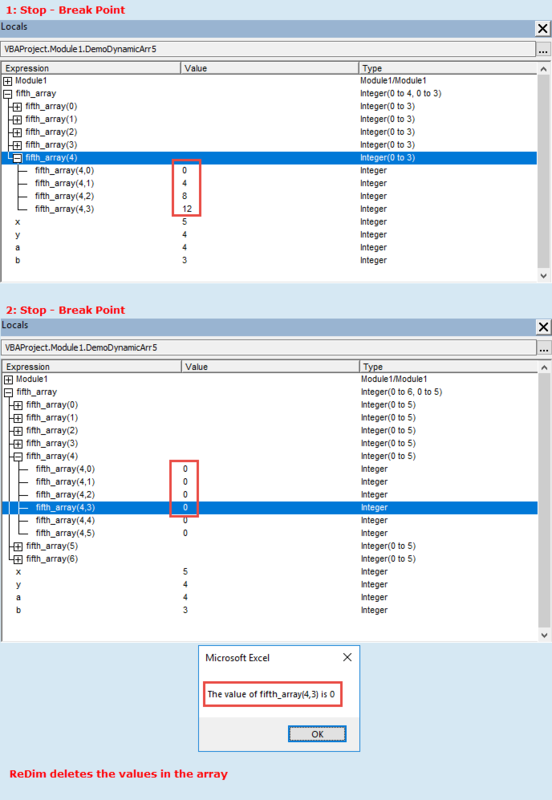 When viewed in Break mode, the code 1 arrays are shown in the Locals Window (figure 1). Price1D has only one dimension and is equivalent to a row vector. The first element, index 0 has value 10. The fifth element, index 4 has value 50. By default, the lower index number of the array dimension is zero. Code 1b: DemoStatic1 commas separate the dimensions. The values in the brackets are the upper index value of the dimension. Code 1c: DemoStatic1 commas separate the dimensions. The values are the upper index value of the dimension. 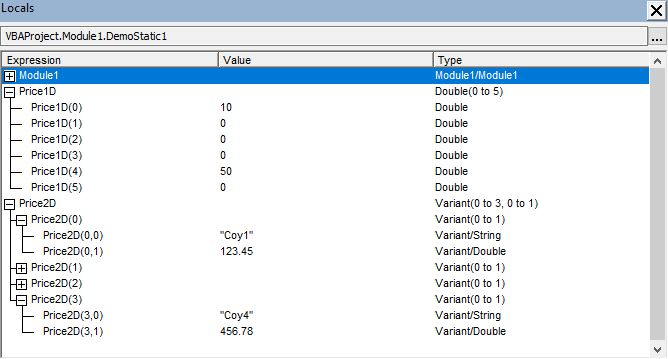 Other example of static arrays are in the next code module. It often happens that the required size of the array is unknown at the time that the code is written. 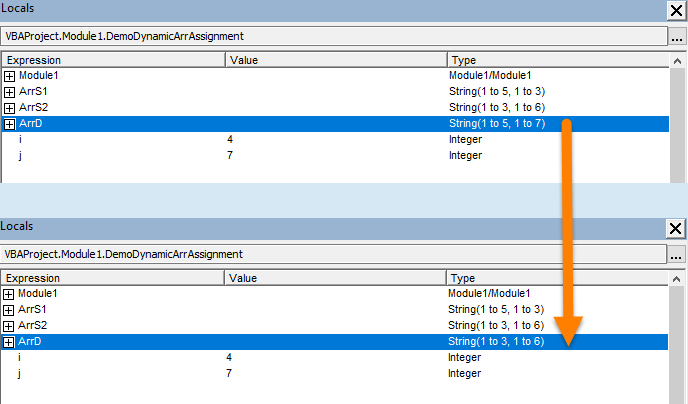 The solution is to declare a dynamic array whose dimension can be varied within the procedure. A dynamic array normally involves a two stage process. 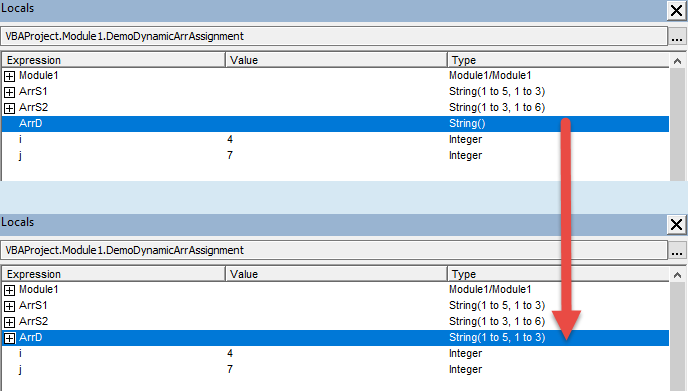 A dynamic array can have its dimension changed whilst the code is running (within certain limits) - see code 2a. An alternate undocumented technique for the creation and dimension of a dynamic array is described by Getz and Gilbert (2006, p.379). This involves use of the ReDim statement to declare (create) the array. See code 2b. The ReDim statement erases all existing data in the array. 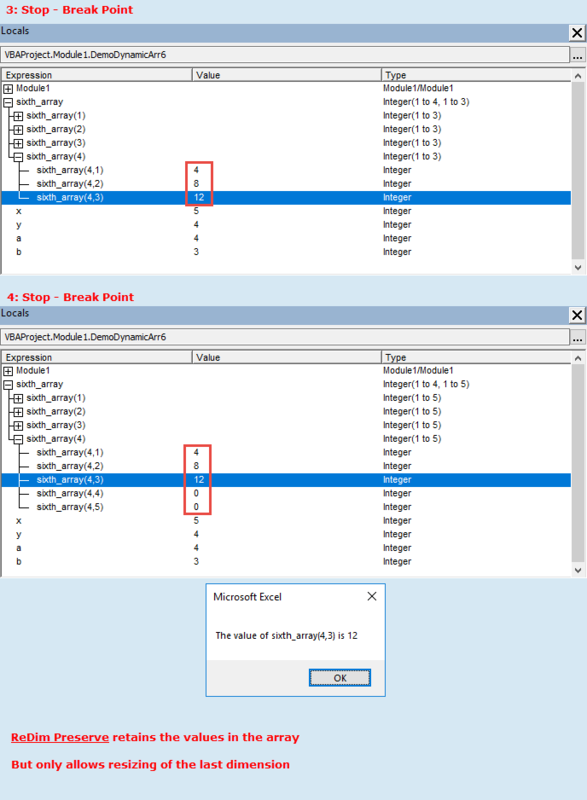 All elements are reset to their default values, such as 0 for numeric type like Integer, and Double, and "" for String type array elements. To retain (preserve) the existing values when the array is resized, include the Preserve keyword. See code 2b line 146. The LBound and UBound functions are demonstrated in DemoDynamic7 and figure 9 below. 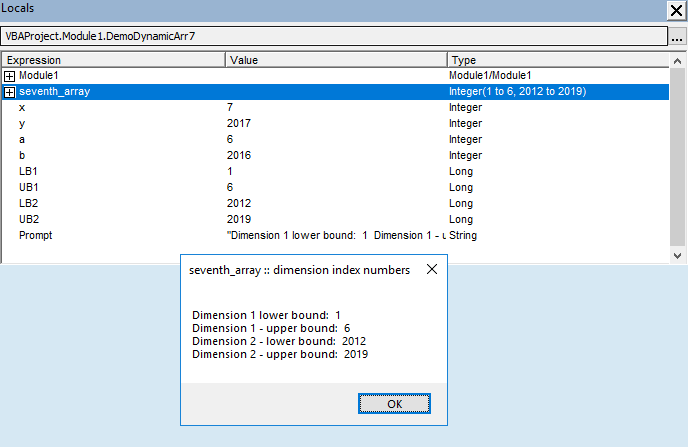 MsgBox Prompt, , "seventh_array :: dimension index numbers"
A dynamic array does not require a ReDim statement if you assign an initialized array, of the same data type, to it. See the examples in code 3. ArrS1(i, j) = "(" & i & "," & j & ")"
ArrS2(i, j) = "(" & i & "," & j & ")"